Copper is a reddish naturally occurring metal. In water it typically is dissolved as a divalent cation (Cu +2). In small amounts, copper is an essential element for living organisms. Copper is obtained by mining copper ores. It is widely used to make copper pipe and tubing. Copper compounds are used as pesticides and herbicides. In water treatment it is widely used as an ingredient in a “redox” process in a product called KDF. 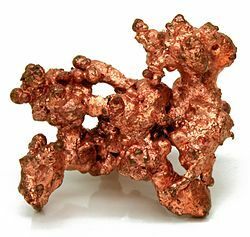 Copper is also used as a mild swimming pool disinfectant in the form of electronically generated copper ions. Native copper. As you would expect, it’s copper colored. It’s good to make wire with, but bad for your liver if you ingest too much. Copper does not break down in the environment, and it can be discharged from wastewater treatment facilities. Regarding Health Effects, too much copper can cause nausea and vomiting, and long-term exposure can lead to liver damage and kidney problems. Copper is a necessary nutrient, but USDA says adult intake should be no more than 10 milligrams per day. Recommended adult intake is 1.0 to 1.6 mg/day. US EPA Primary Drinking Water maximum contaminant level goal: 1.3 ppm. Secondary maximum (recommended to avoid metallic taste or blue-green staining): 1.0 ppm. Copper can be controlled in whole house (POE) applications and plumbing fixtures protected by cation exchange (water softener), pH control, and film-creating compounds such as polyphosphates. Point of use treatment. Reverse osmosis removes copper handily–usually around 97%. Copper can also be removed by distillation and activated carbon adsorption. Sources: Water Technology Volume 32, Issue 11 – November 2009. Enting Engineering Handbook. Pure Water Occasional.